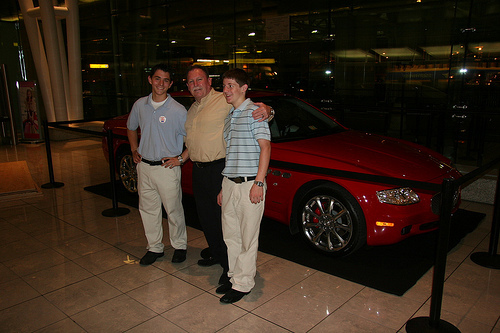 WHO IS THE NEW SEPT. 6, 2008 ROAD RALLY AND BALTIMORE COUNTY CAR SHOW HOST–AND WHAT HAPPENED TO THE VOLUNTEERS FROM “THE CONCORSO” RALLY CREW? We’re all lined up with breakfast and lunch from Ciao Bella Restaurant, Sweet Lela’s Market Cafe, and Adore Entertaining. We’re happy to have PSA Financial on hand from insurance broker John Lannon. Kevin Goodman from Chapin Davis Investments will be on hand to say hello. Patrick Moylan from Signature Flight Support is confirmed to have a kiosk for our clients to peruse. We’ll also be announcing some upcoming event surprises working in tandem with Patrick and the USO Metro’s Shauna Van Buren AND the Children’s Guild to boot. Even better, on the day of the rally (09/06/2008) our service team is lined up to have Caffe Dei Miracoli coffee with everyone and answer mechanic and car detail questions both before and after we hit the road. We hope to see the rise of a “Coffee Clutch” tradition come from the event, so start thinking hard about your questions now and we’ll do our collective best to answer them for you. As for the details about how our event staffing will be handled and run, Adrienne Trout will be ready to help check people in and collect ticket money and donation to the USO Metro for us. Randy Moss from the Car Corral will also be on hand helping us review the rally setup. Chuck Leutner from the FCA and Children’s Guild Friends are also going to be on hand to get the word about about the USO Metro initiative (and to help us promote our local civic participation in the Children’s Guild September 28, 2008 “All Italian Car and Motorcycle” Concours D’Elegance exotic car show helping raise money for their non-profit organization in Baltimore’s Inner Harbor “Harbor East”). Keep in mind half our staff will also be at the Mount Washington Wine, Art, and Jazz festival that Sunday, Sept. 28th, too–so wherever you are in town that day stop by to say hello and check our incredibly cool cars out. Say hello to Chapin Davis there that day–we’ll be parked nearby their booth. SO THAT’S THE STORY LINE IN A NUTSHELL, ALL TIDIED UP. If you are a vendor, sponsor, or volunteer who would like to jump on the bandwagon and participate in the event, click here to let us know. CLICK HERE TO PLACE YOUR NAME AND VEHICLE INFORMATION ON OUR “FIRST COME FIRST SERVE” LIST OF RESERVATIONS. On with the show. Call us at 410-321-8071 with any questions or email us at any time if you need us. Despite Dave and Jon’s cancellation notices about our Concorso Rally segment on their personal website, don’t be confused! 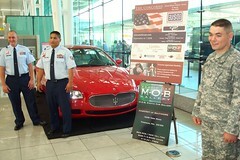 We are STILL FULLY ON at Maserati of Baltimore supporting the USO. We plan to host our MOB EXOTICS morning rally portion of the event September 6th, 2008 as the event promoters all on our own and Signature Flight Support and Chapin Davis Investments (key sponsors) are on board to help us host an impromptu CAR SHOW in the afternoon. We’re just calling it “Maserati of Baltimore Rally for the Troops” as a courtesy to “The Concorso” group. We’ll be rallying starting at 9am as planned on Saturday morning with all our USO Metro friends, Ferrari Maserati of Baltimore and Washington, and Lamborghini MOB EXOTICS clients. Cars can wash up in our service bays from noon until 2. That leaves us 2-6pm for a community car show event–something we simply like to do. The USO Metro is happy to be the beneficiary, too. WE ARE PREPARED FOR 80-100 CARS TO DRIVE OUR RALLY ROUTE (2 PEOPLE PER CAR IS THE REQUIRED SAFE NAVIGATING MINIMUM). MOB EXOTICS WILL ACCEPT ENTRIES ON AN ADVANCED RESERVATION LIST OR AS A FIRST COME FIRST SERVE. CAR SHOW SPACES ARE LIMITED TO 100 COMPETING VEHICLES. OFF-SITE PARKING IS ENCOURAGED FOR SPECTATORS AND LOCAL VISITORS. All rally participants who receive a refund for any portion of “The Concorso: Celebrating the Art of the Automobile” are eligible to attend the rally at NO COST. Guests attending the rally as new ticket holders are requested to make a $25 per car donation. Car Competitors who want a chance to win BEST IN SHOW FOR THE USO will be contributing an additional $50 per entry donation. The USO will be on hand to take additional donations of gifts, money, or simple spectator wishes of support back to the USO Metro lounges at our local area airports. We appreciate your continued Lamborghini, Maserati, and Ferrari club participation in our Maserati of Baltimore fund raising initiatives. Please make all reservation checks out to the “USO METRO DC”–cash payments will be accepted the day of the event by USO Metro representatives. Updates will be posted on our blog shortly. Despite “slow ticket sales” for the other segments of the event, our RALLY TEAM has been rockin’ and is still up and running, wide open, and ready to roll! Thank you, all, for following up. Please contact Jack Davis at mobexotics@gmail.com with ANY questions… and the “official” newsworthy and quotable word from us? Though we are really going to miss hanging out with the volunteer team folks down at Signature, BWI, and Power Plant LIVE, they have all been invited to come make a day of it with us here at 1628 York Road on September 6th, 2008.